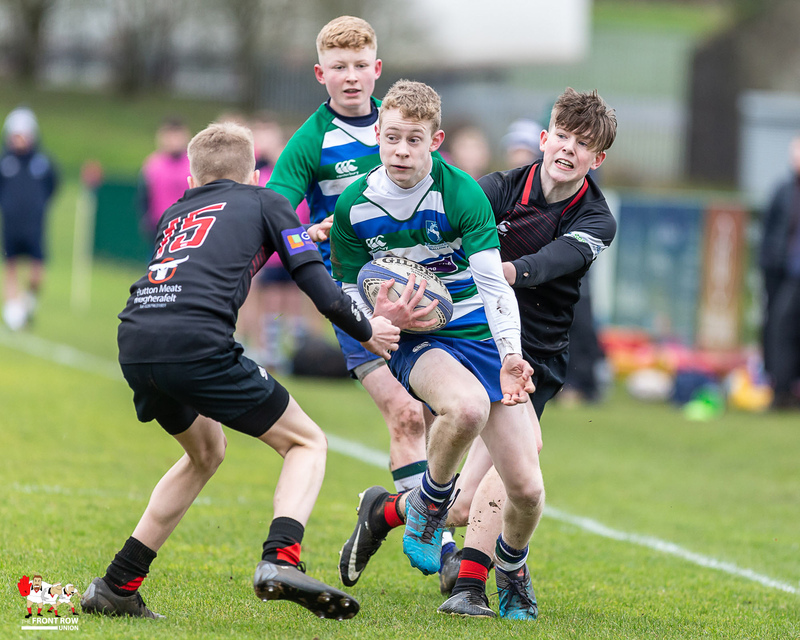 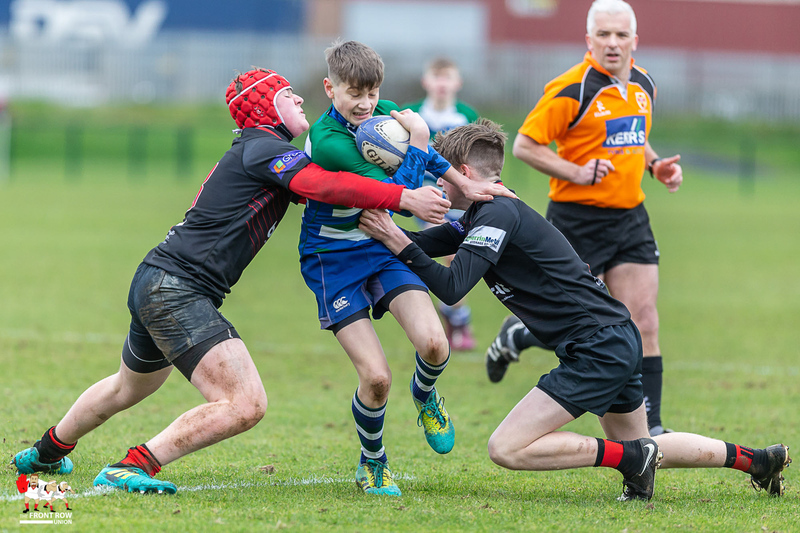 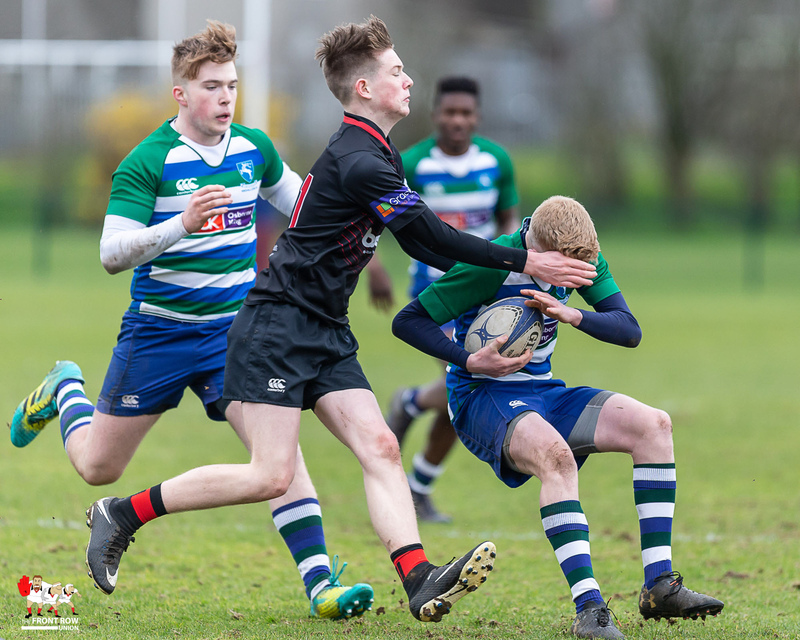 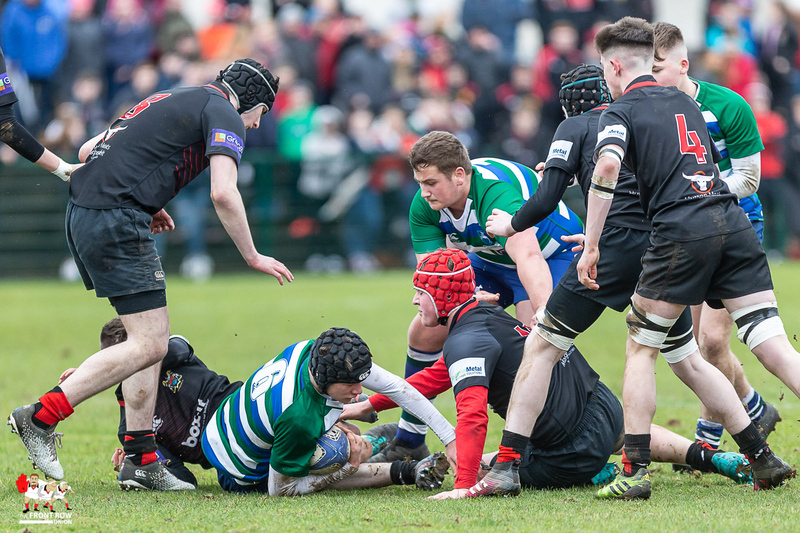 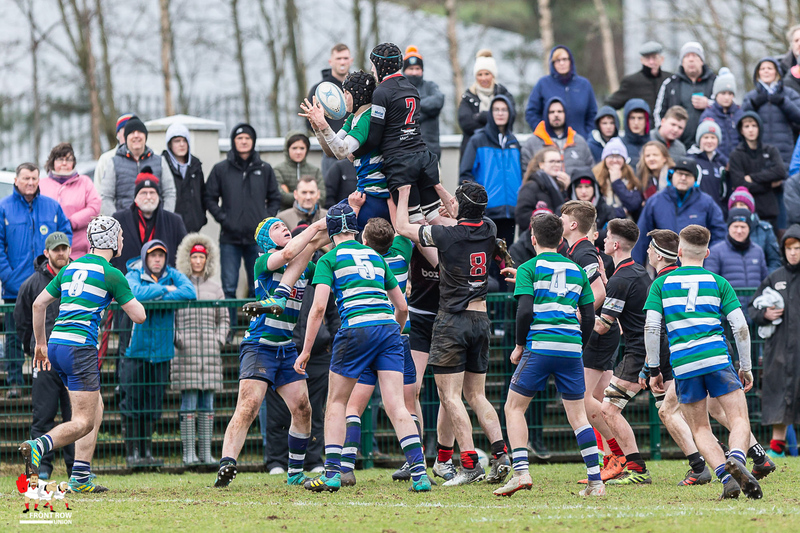 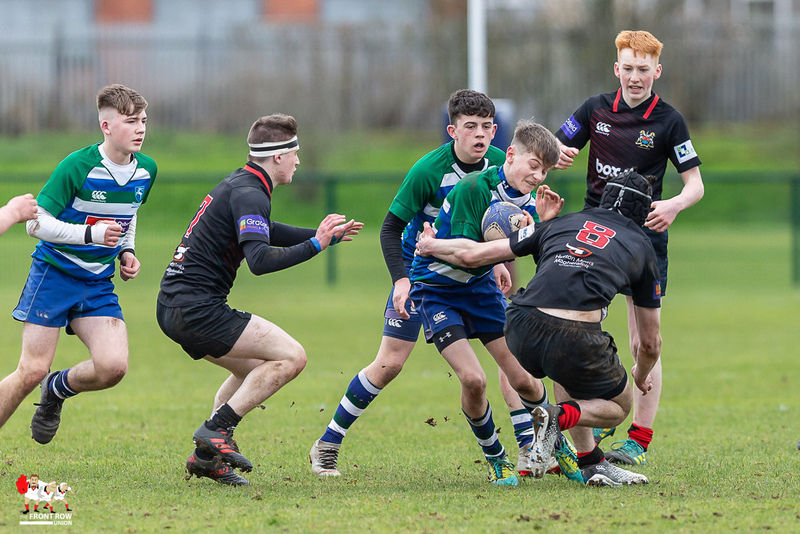 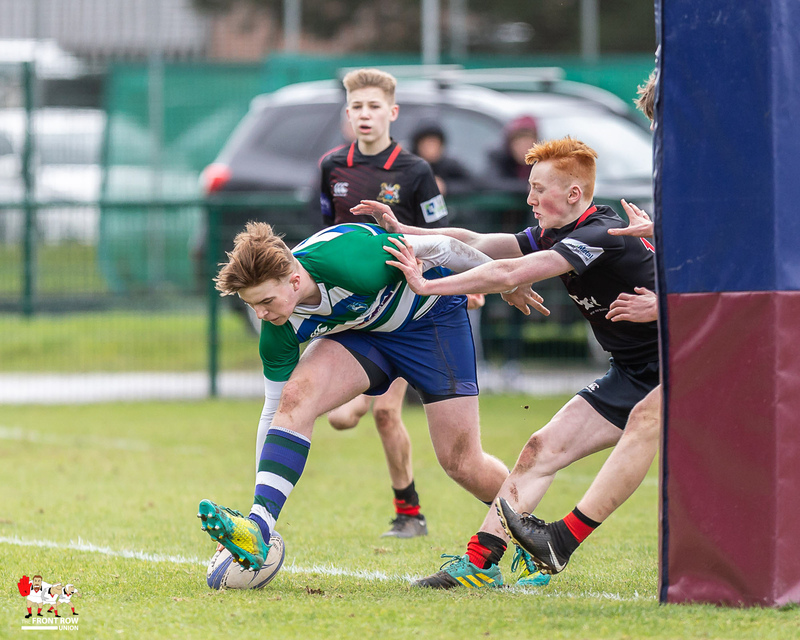 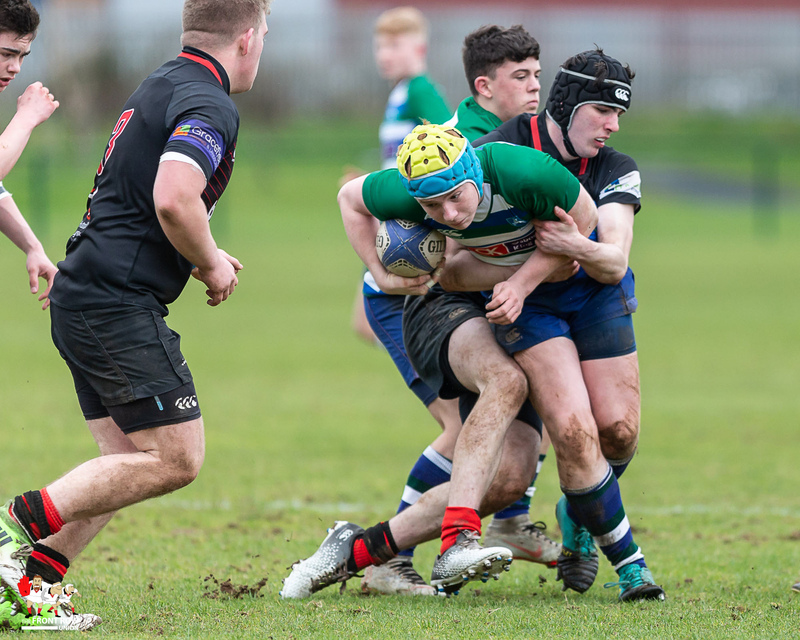 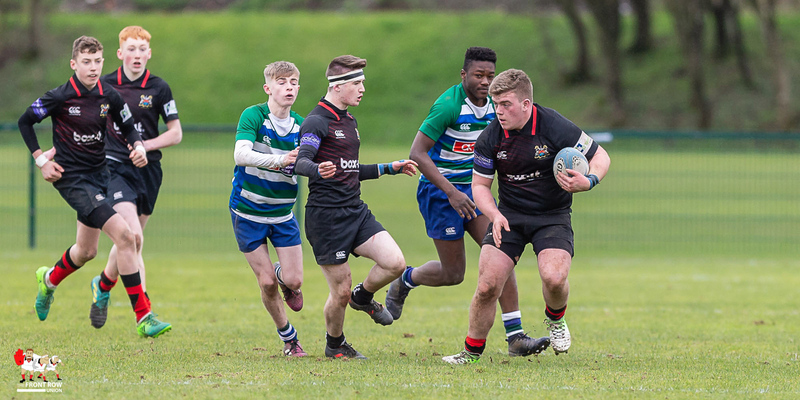 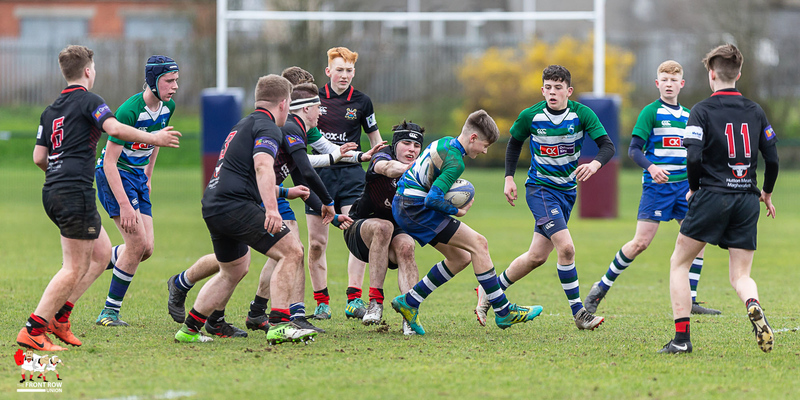 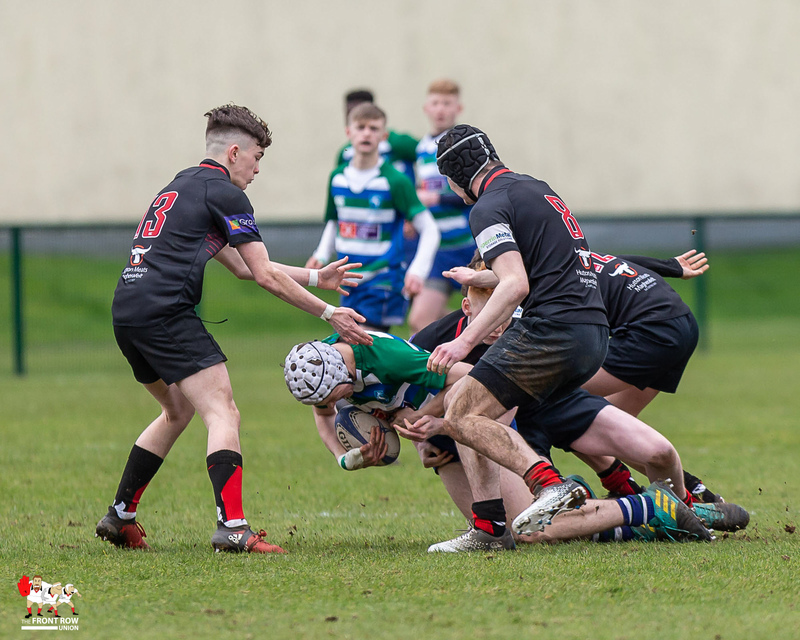 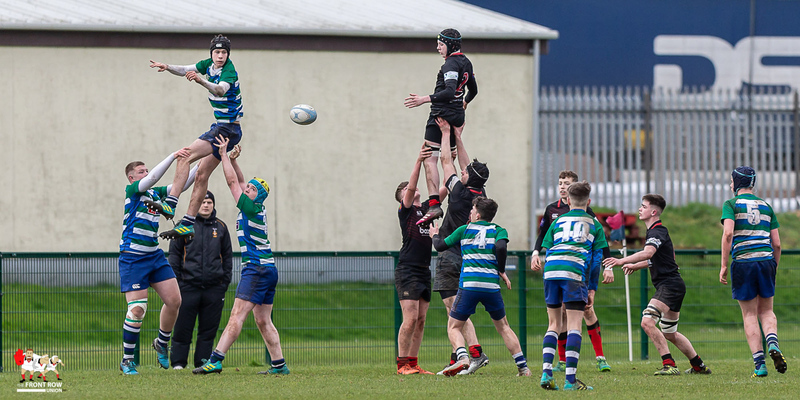 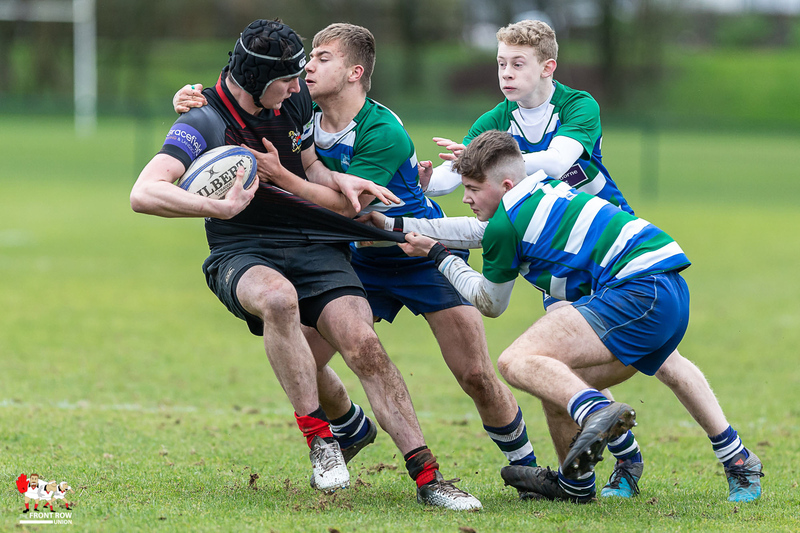 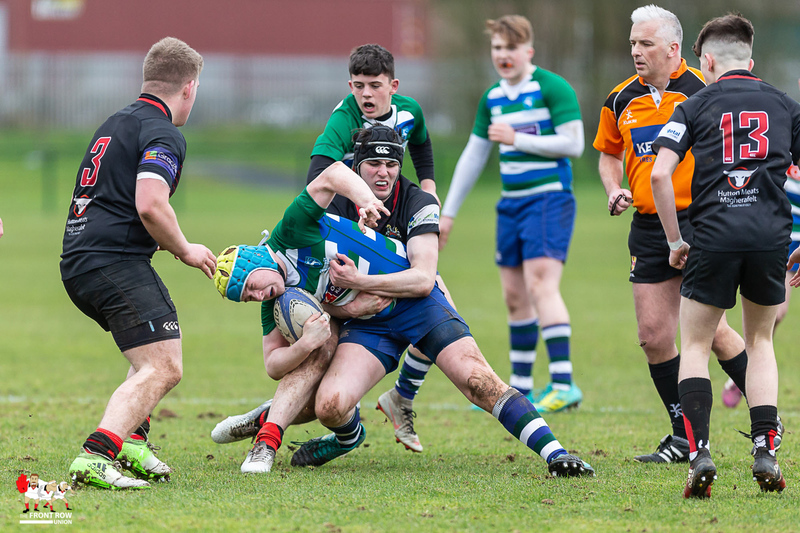 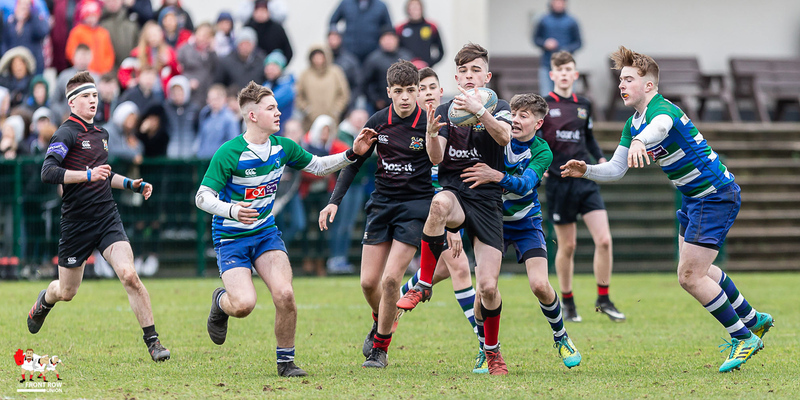 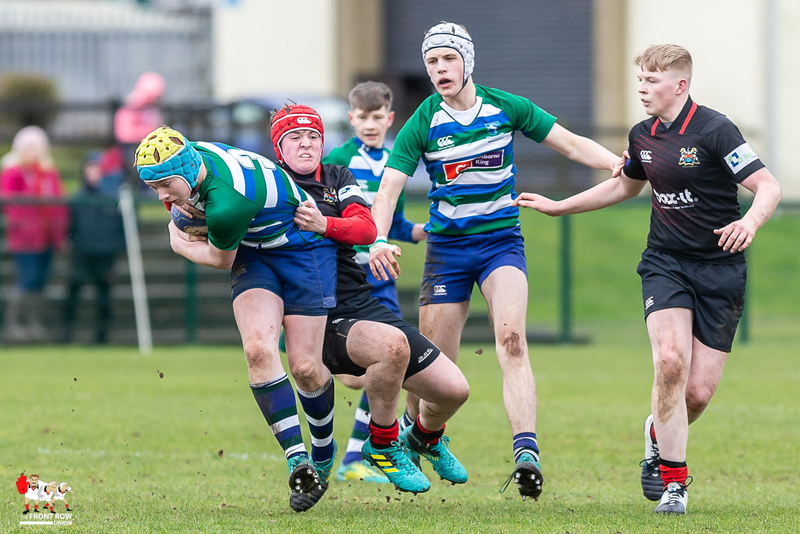 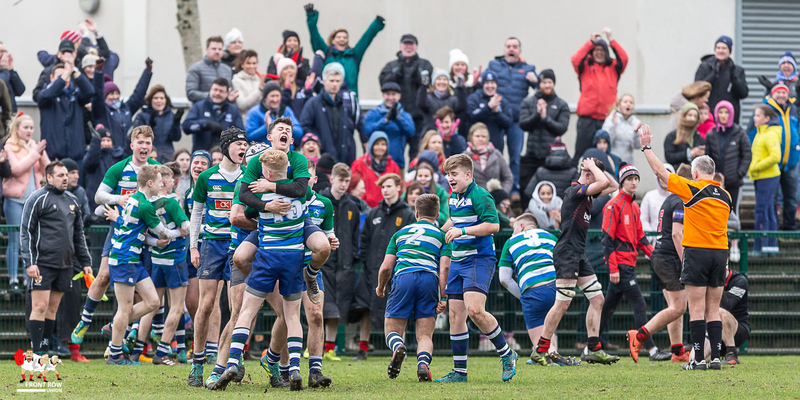 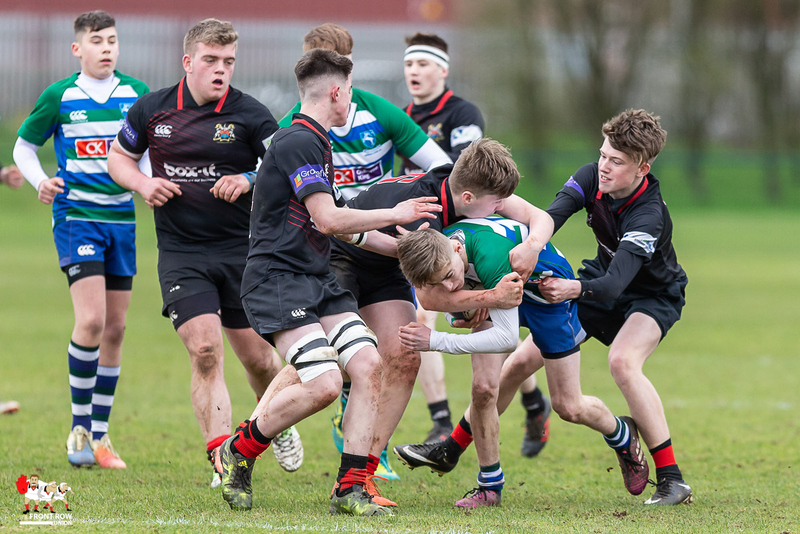 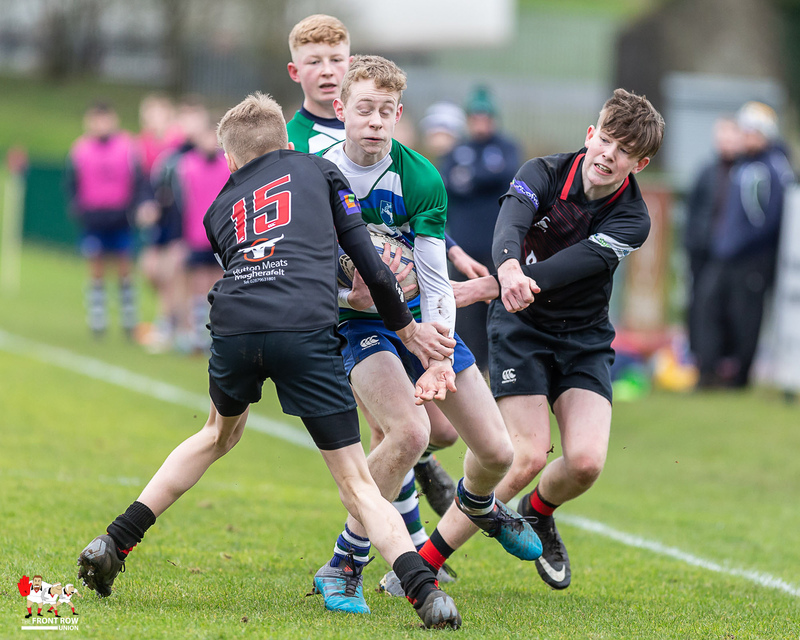 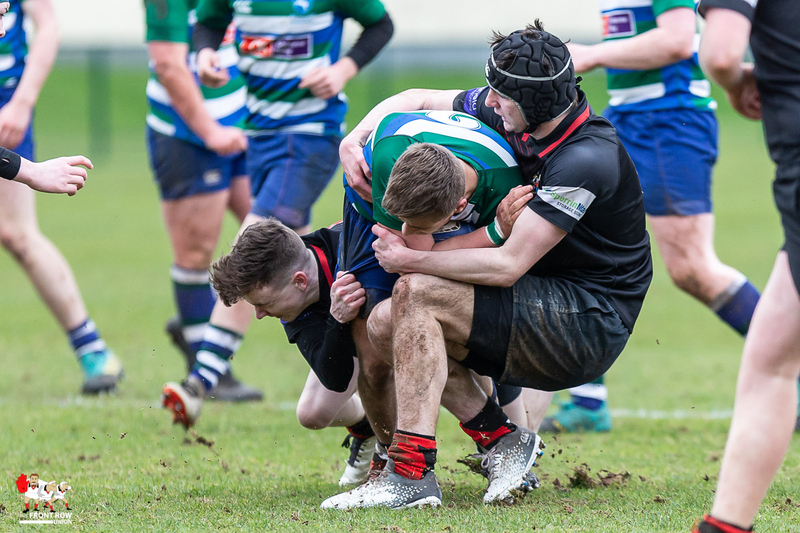 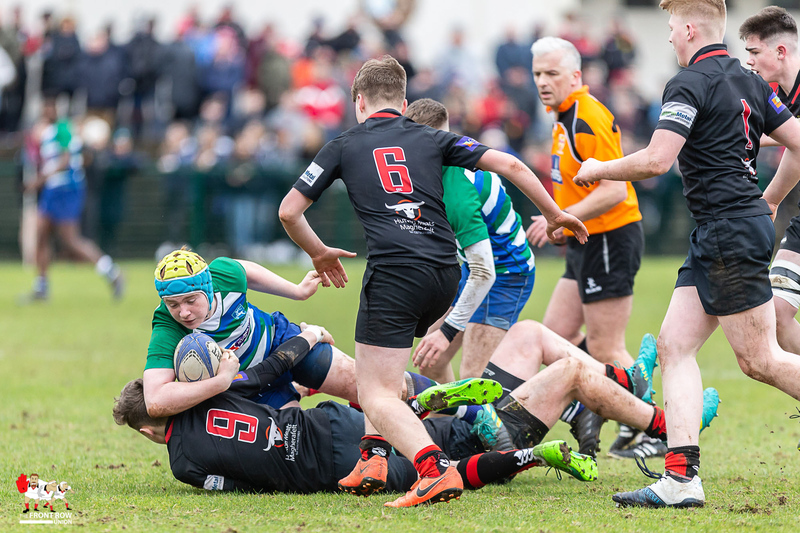 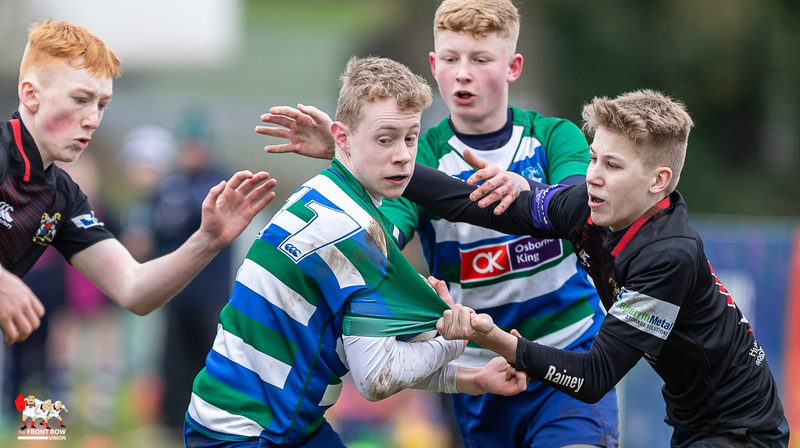 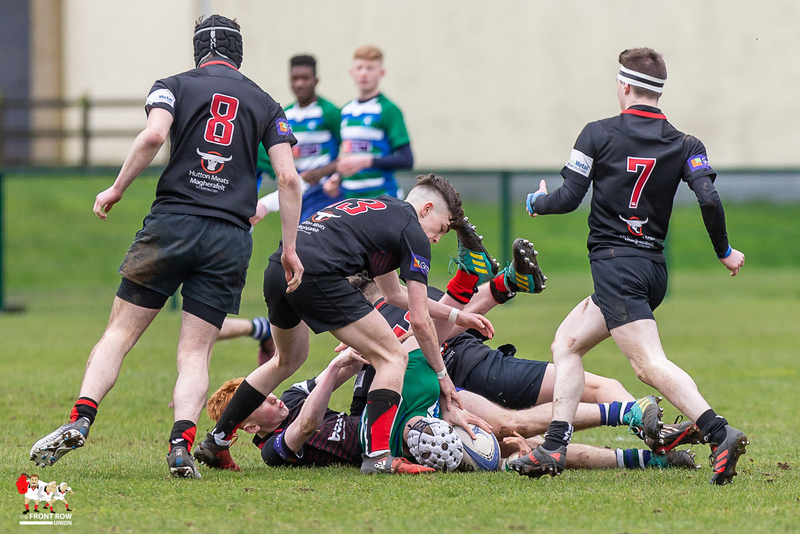 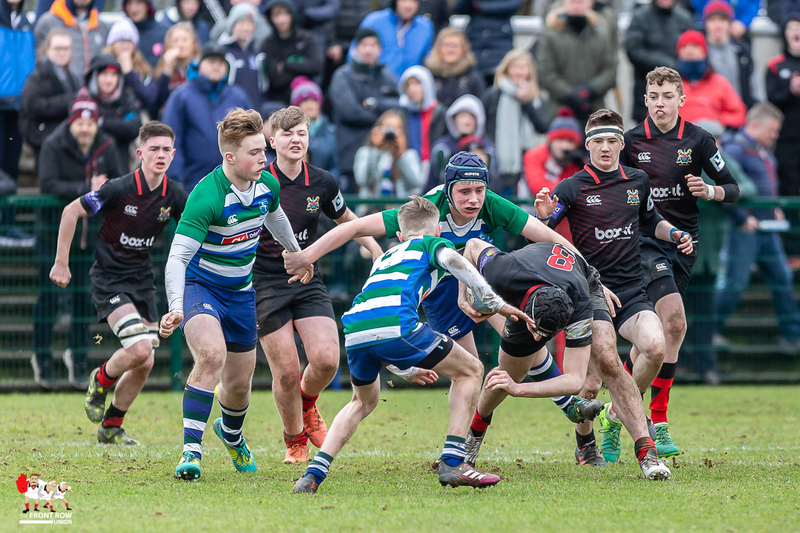 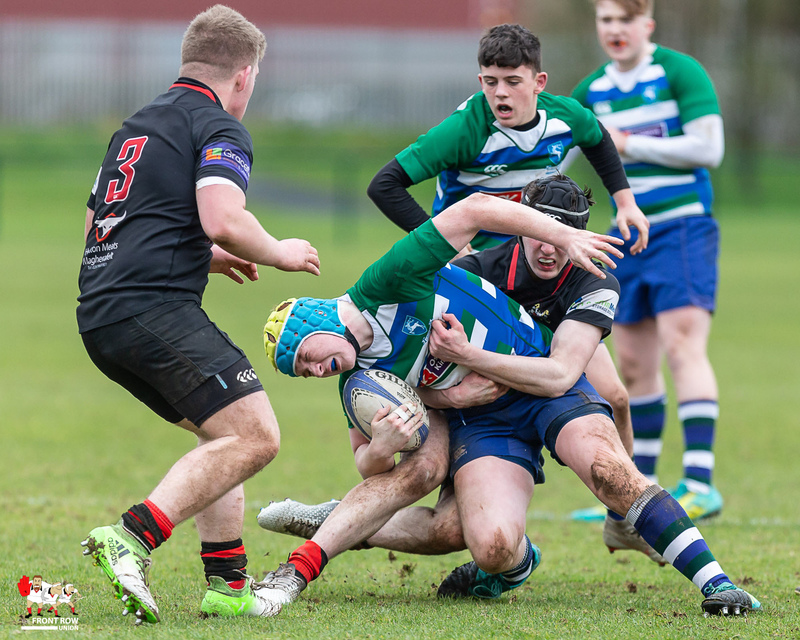 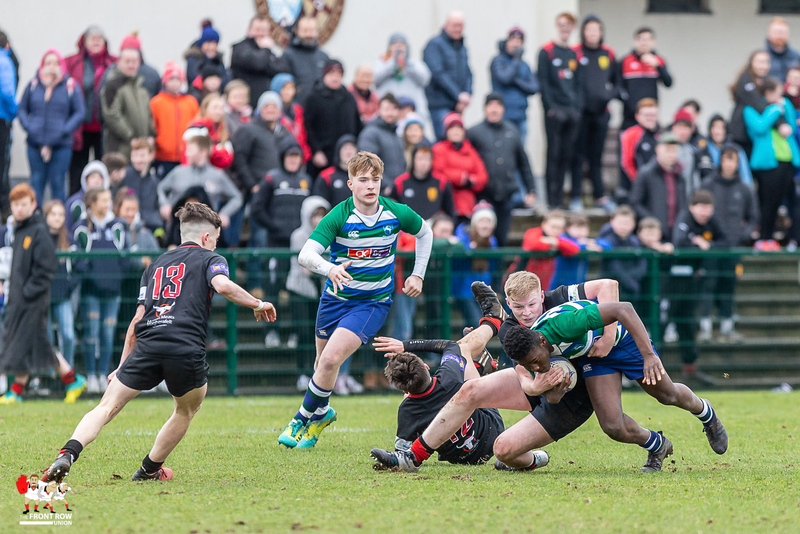 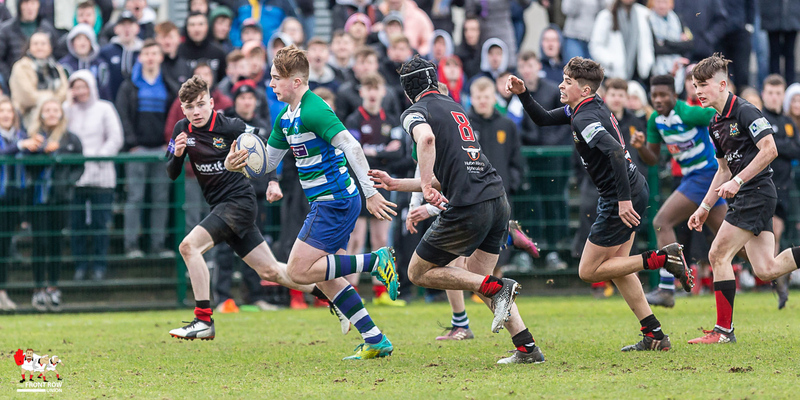 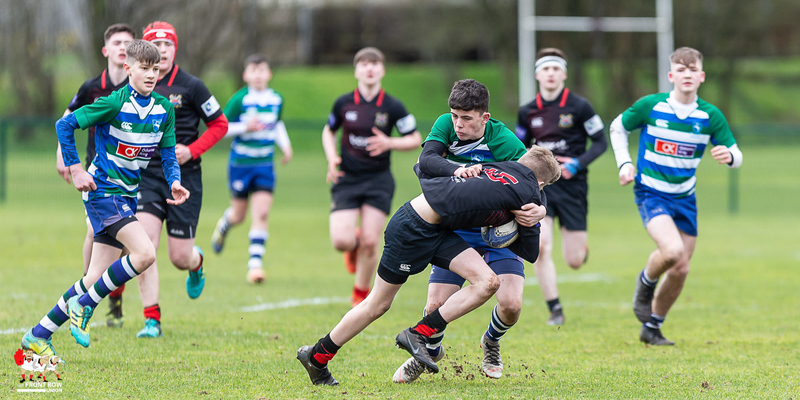 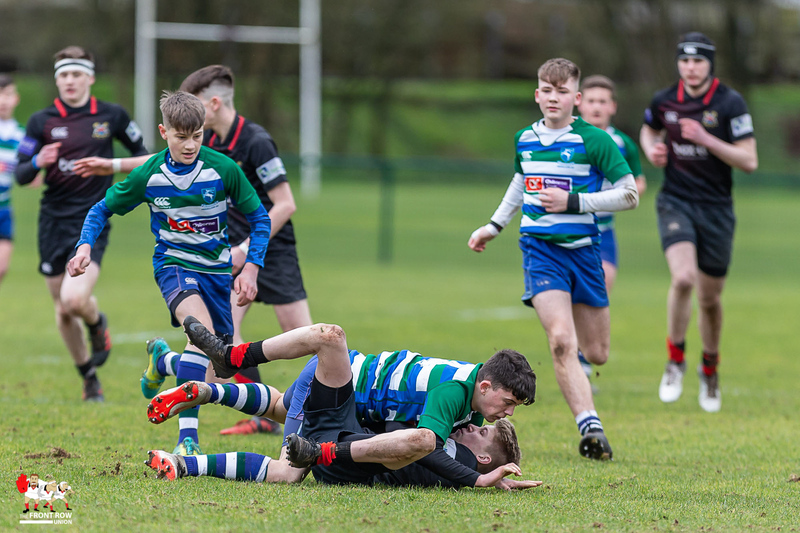 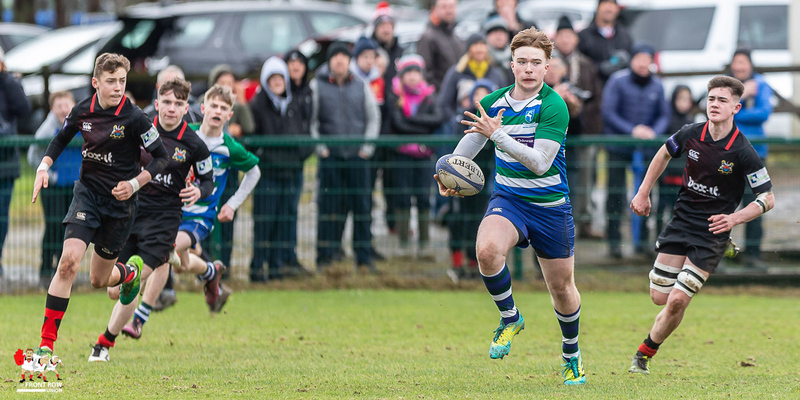 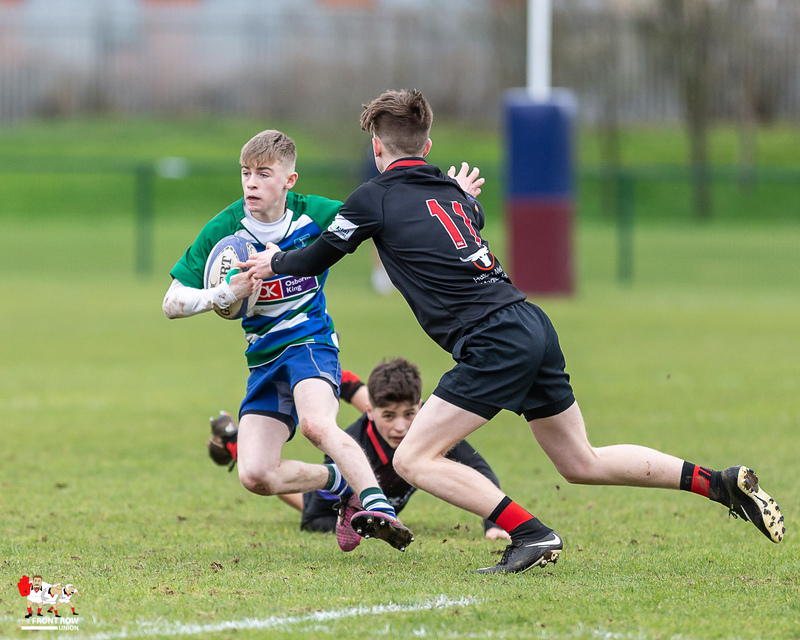 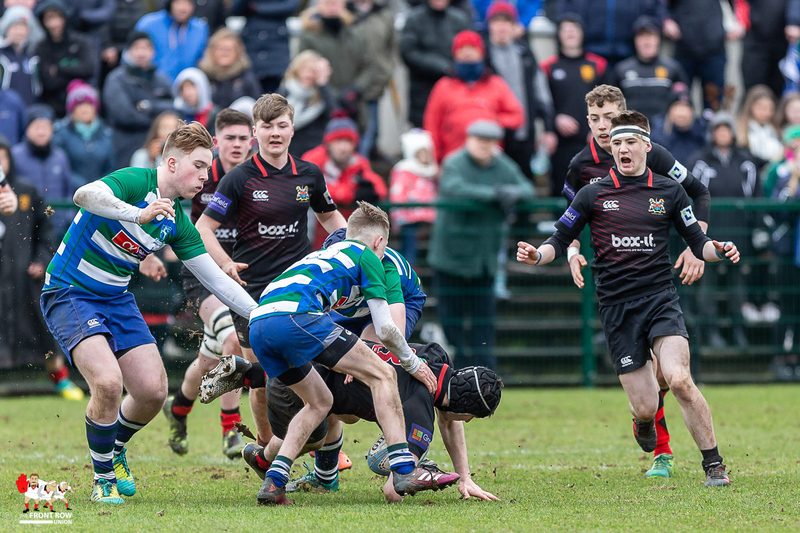 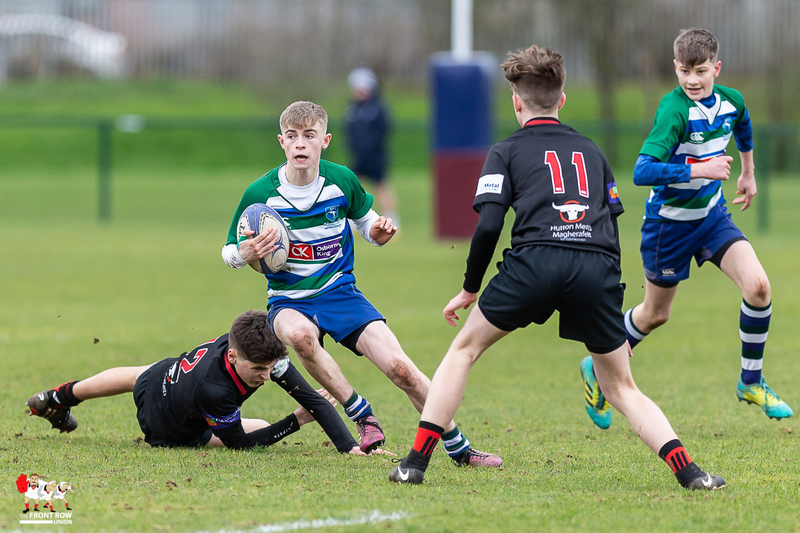 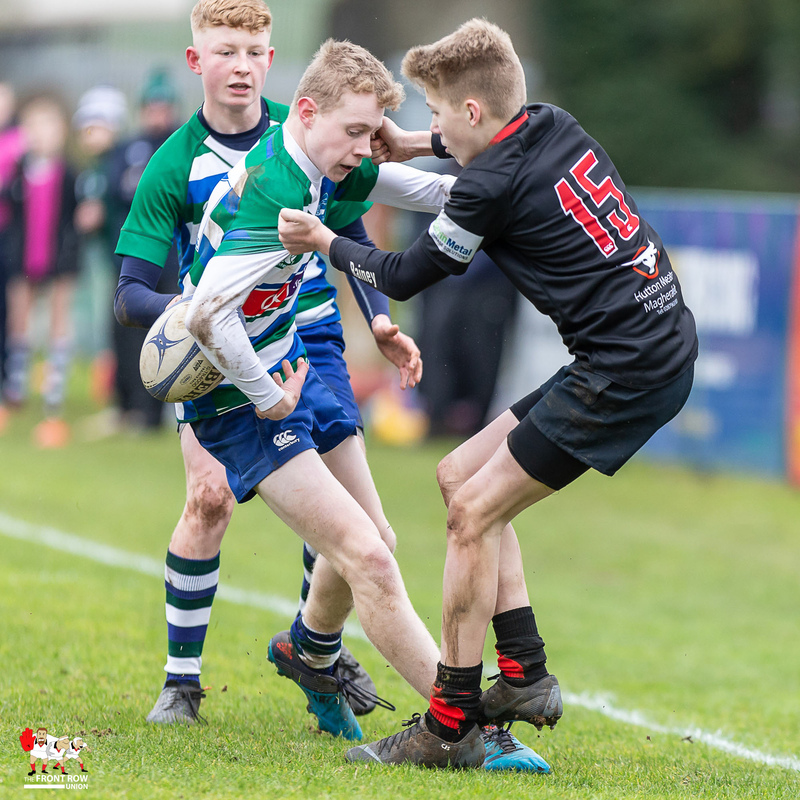 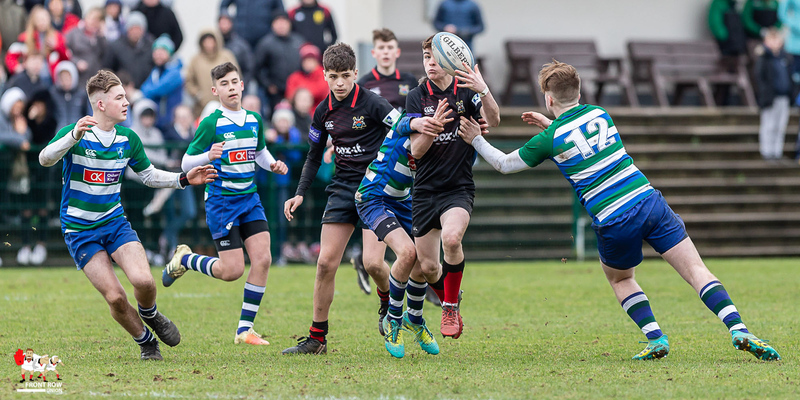 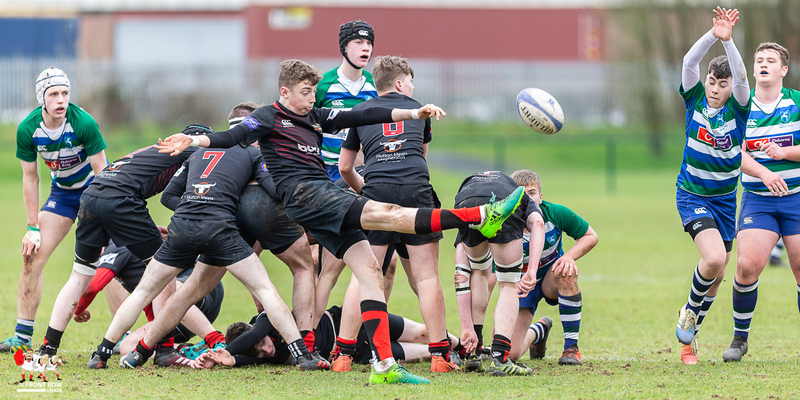 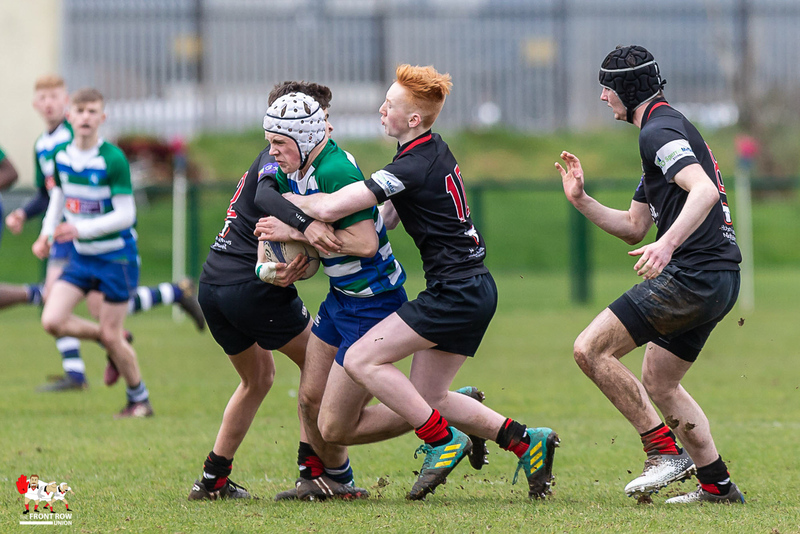 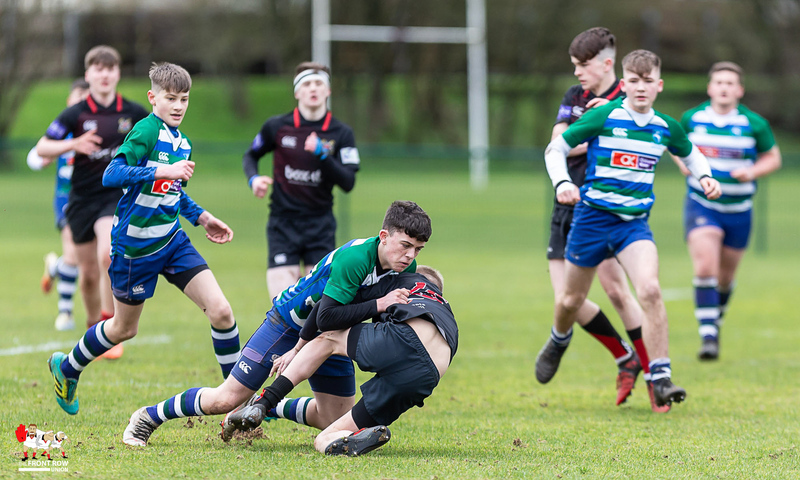 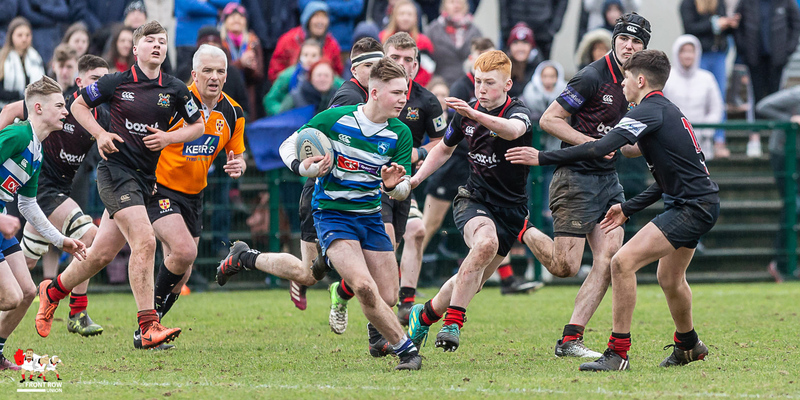 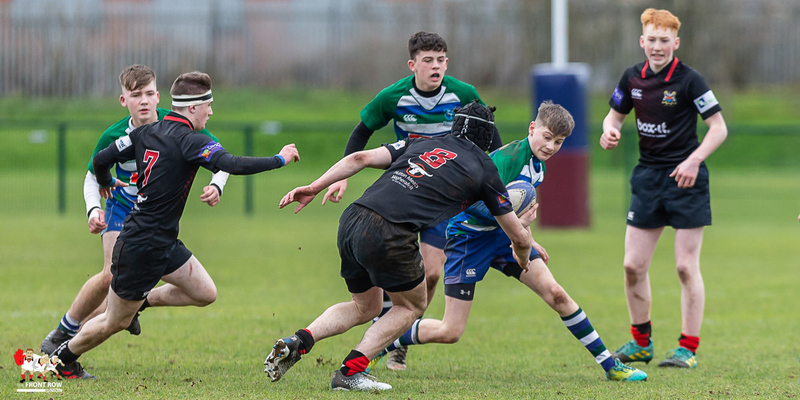 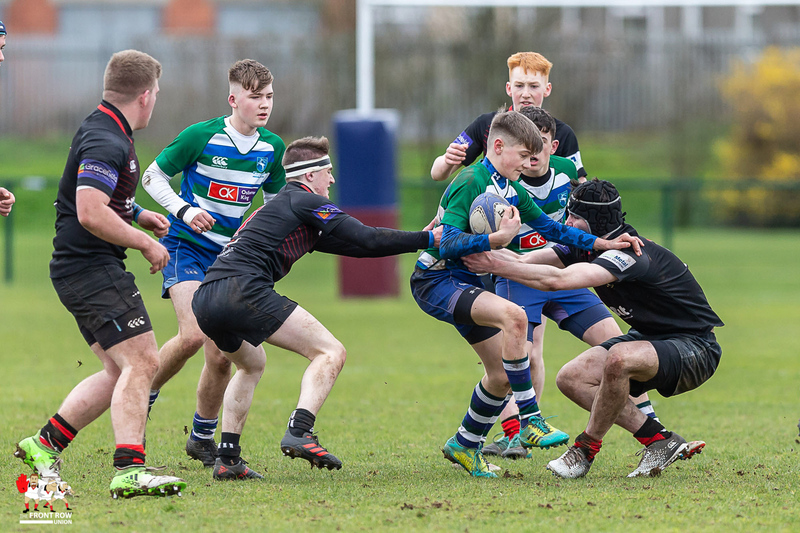 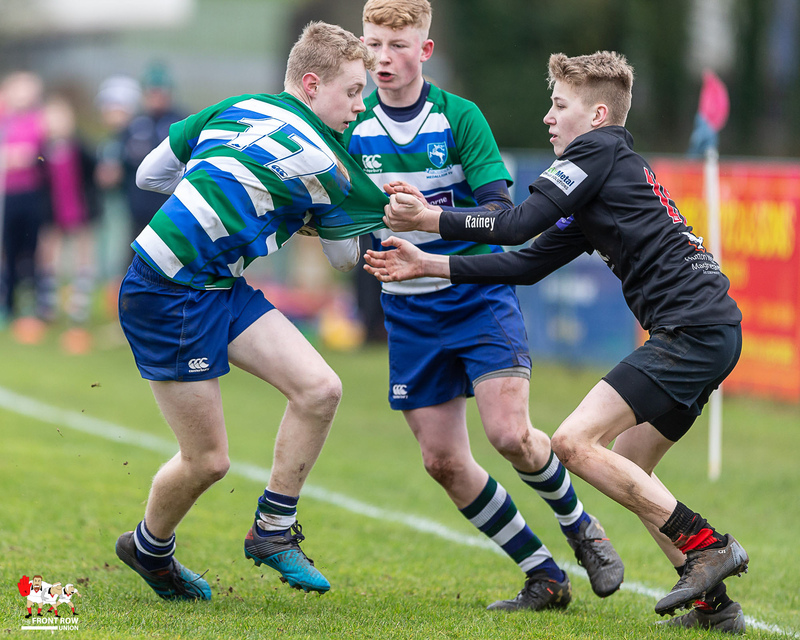 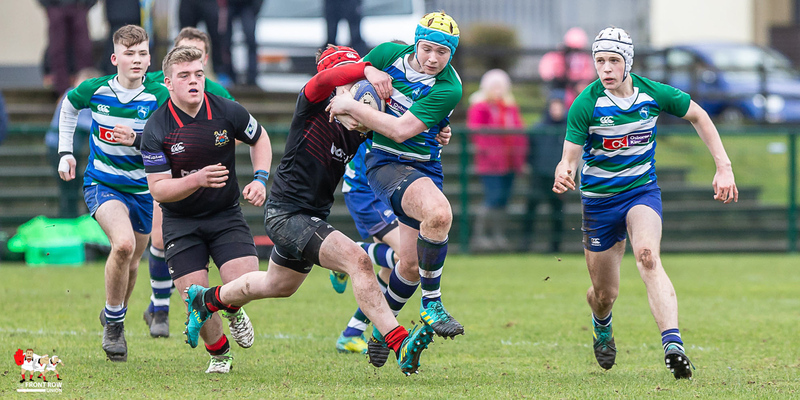 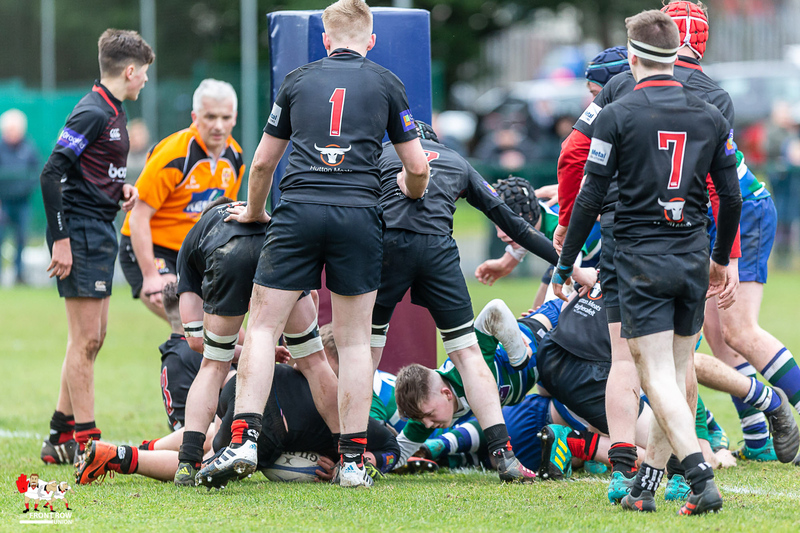 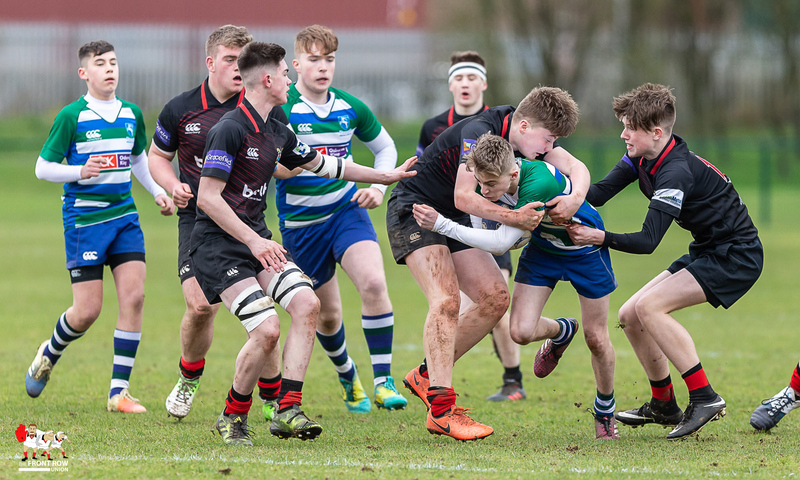 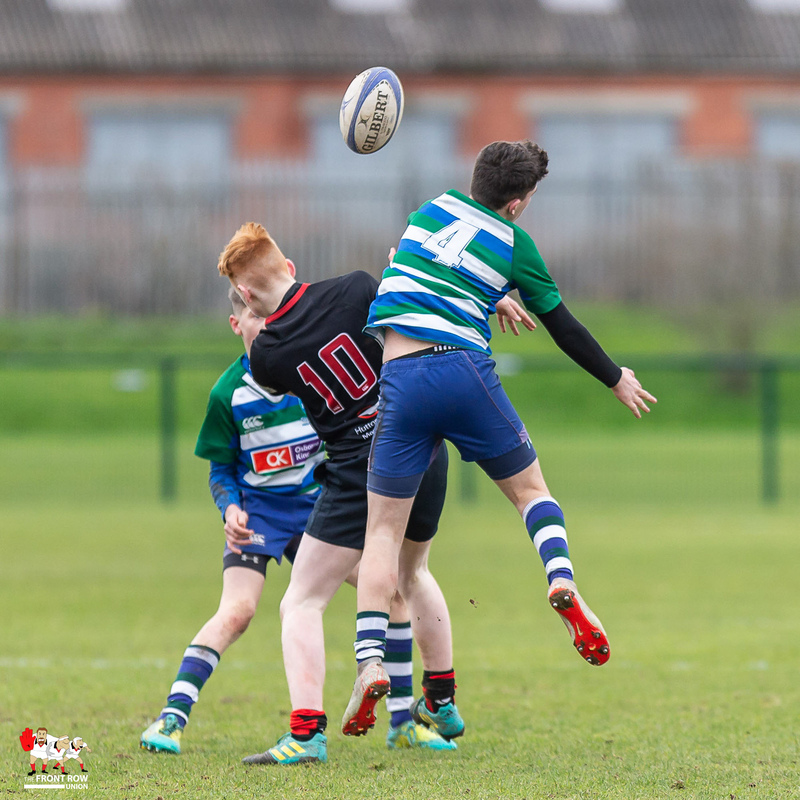 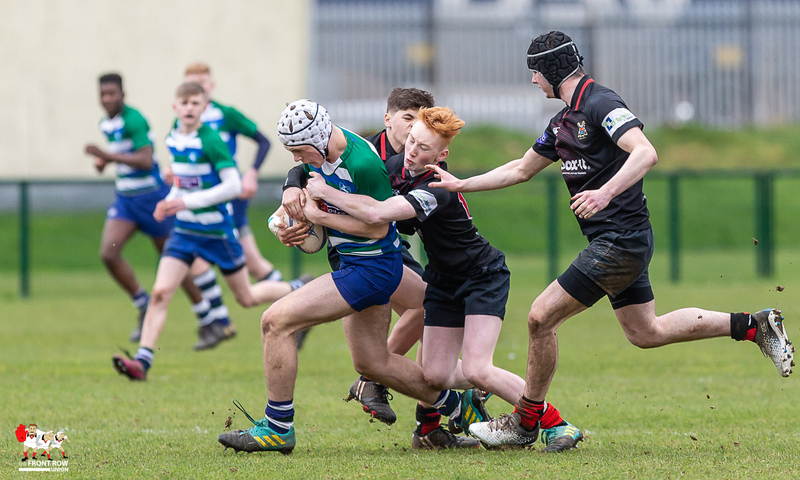 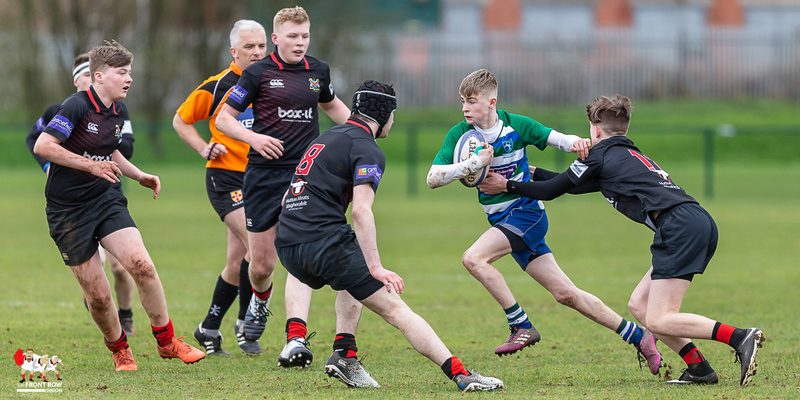 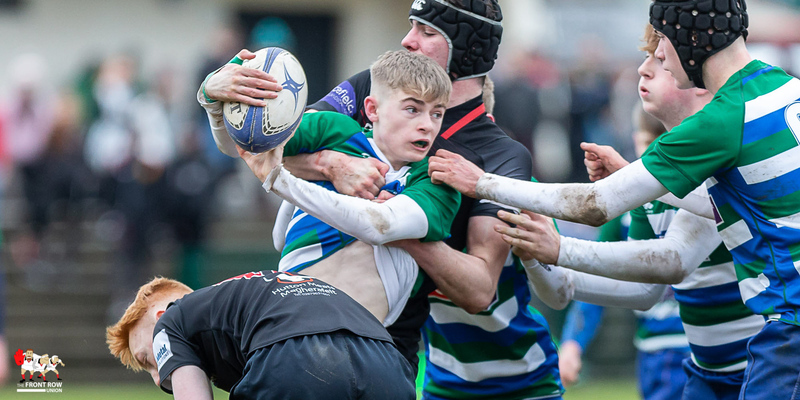 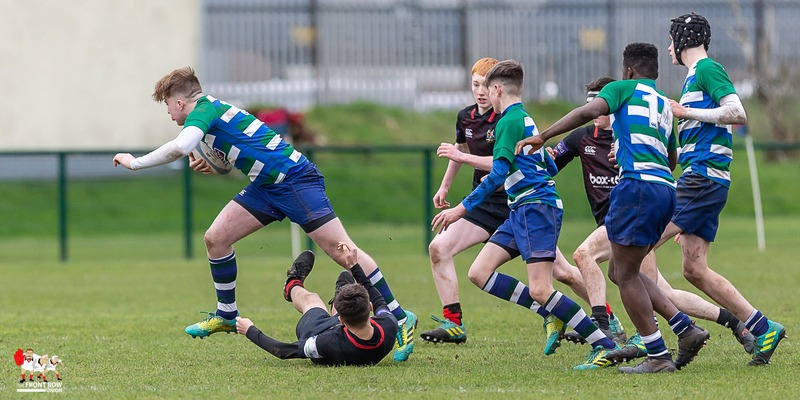 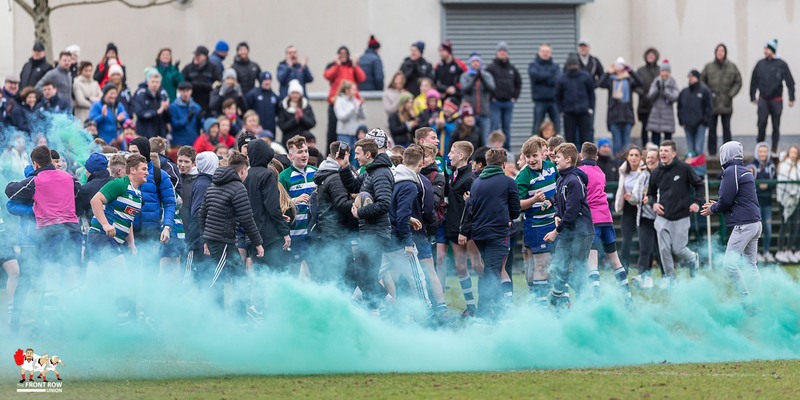 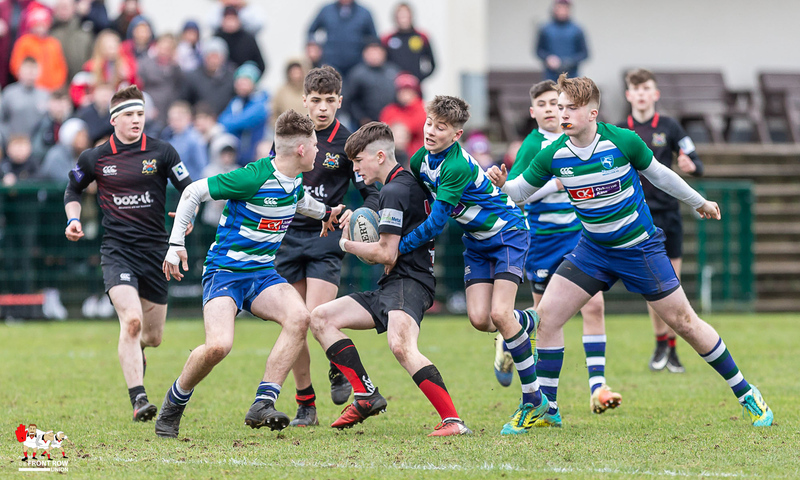 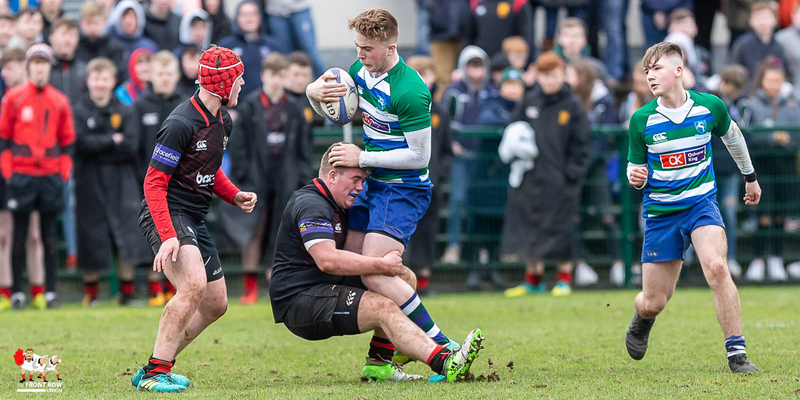 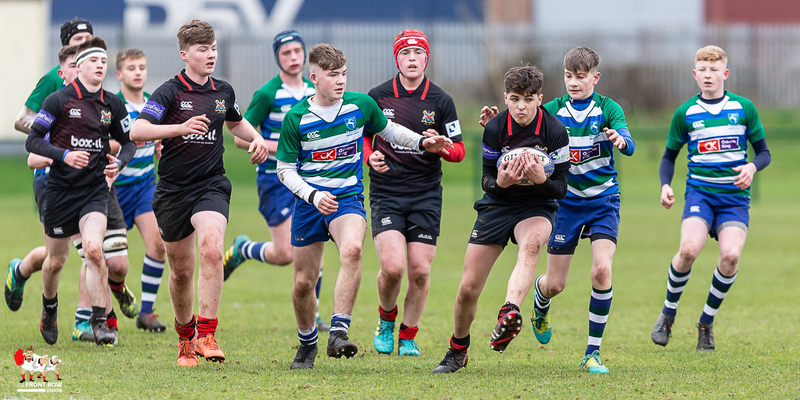 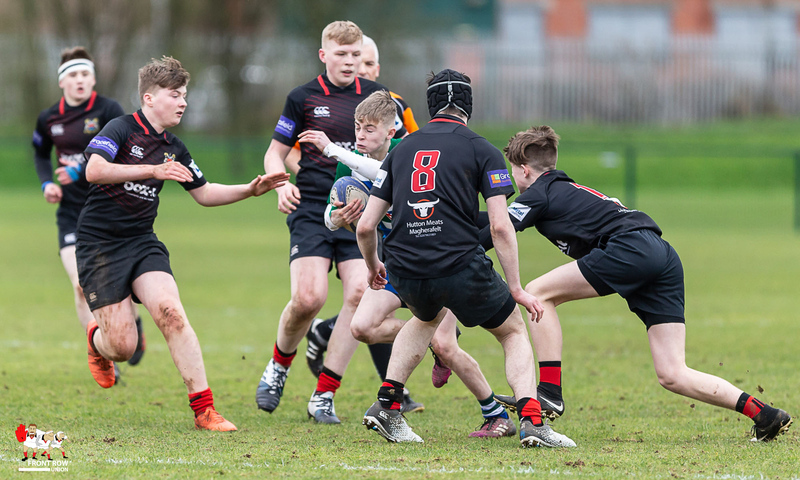 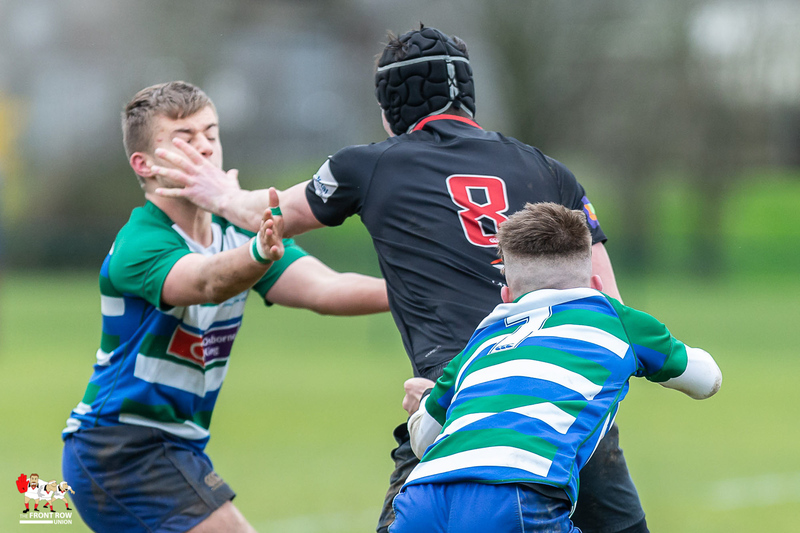 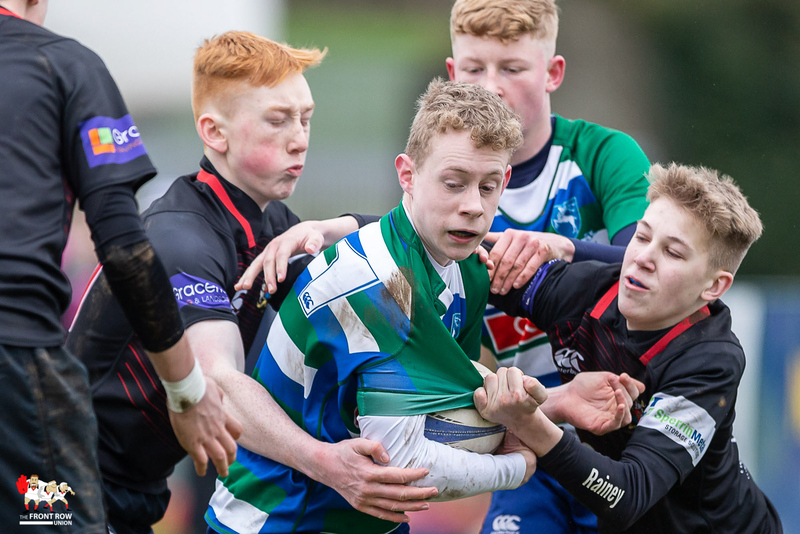 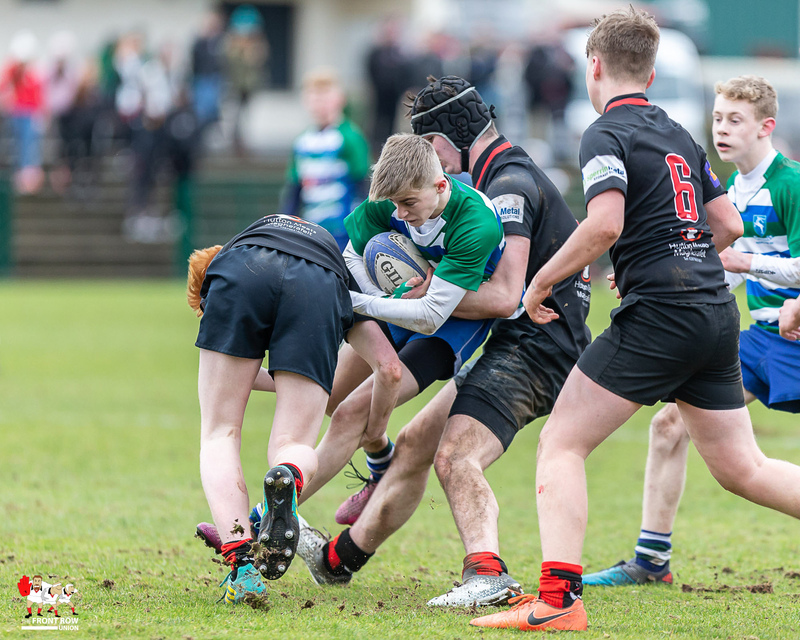 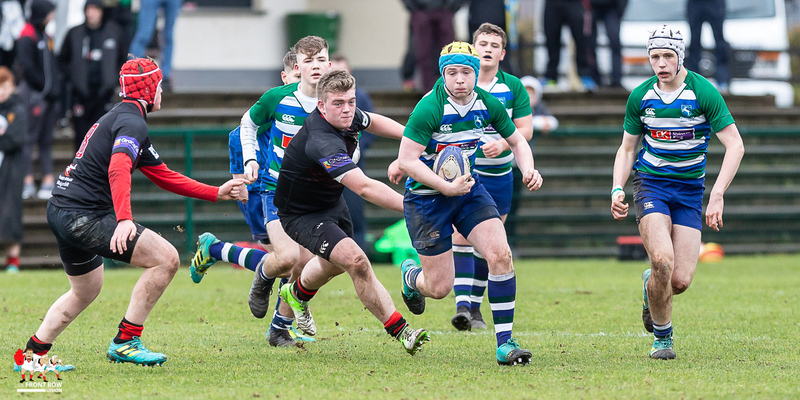 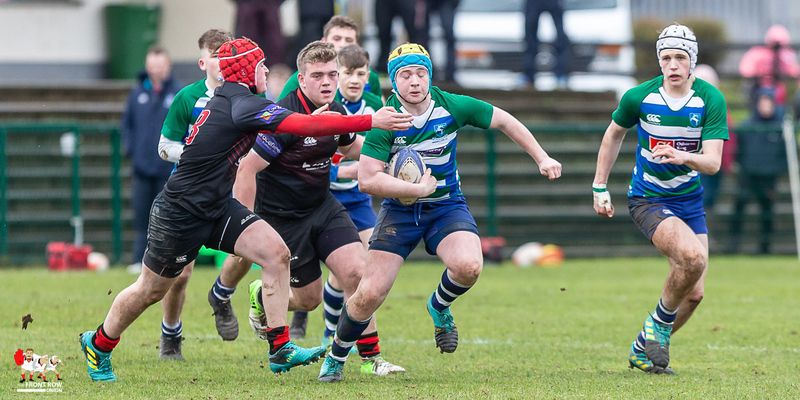 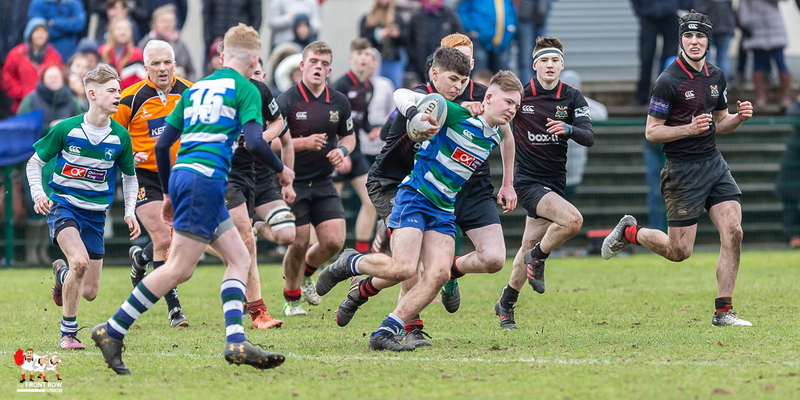 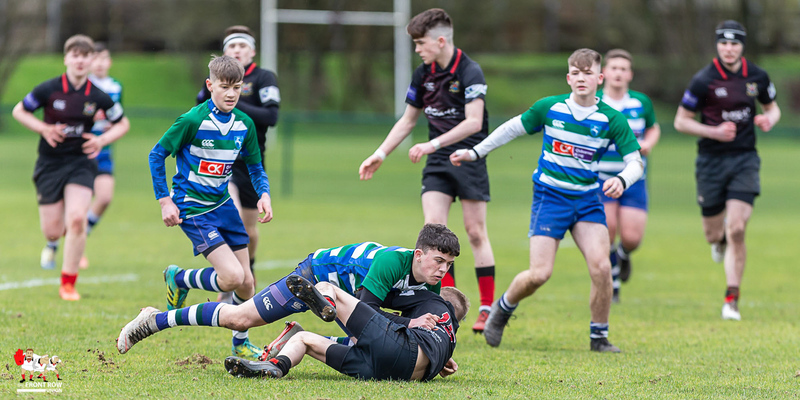 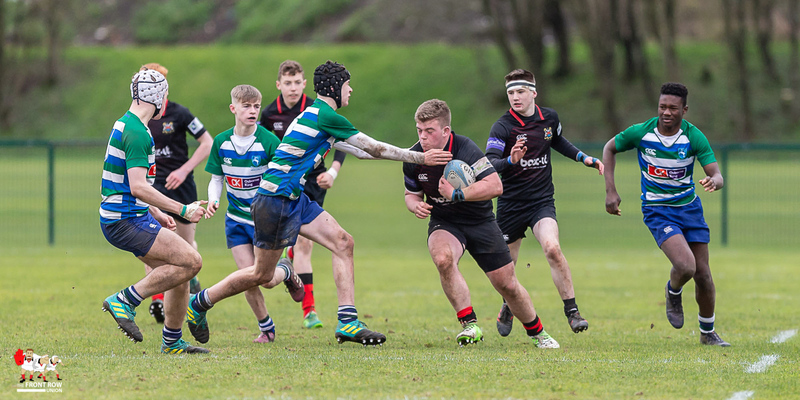 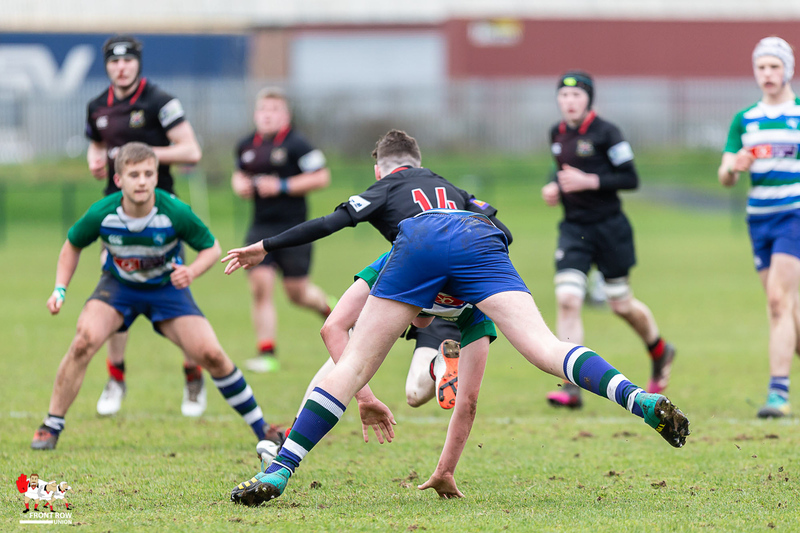 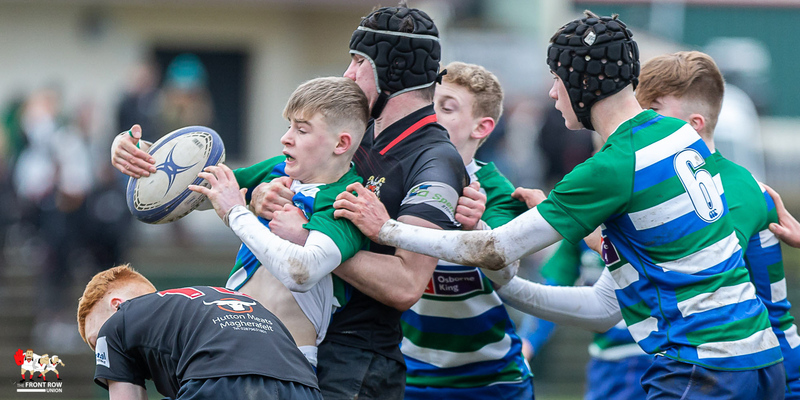 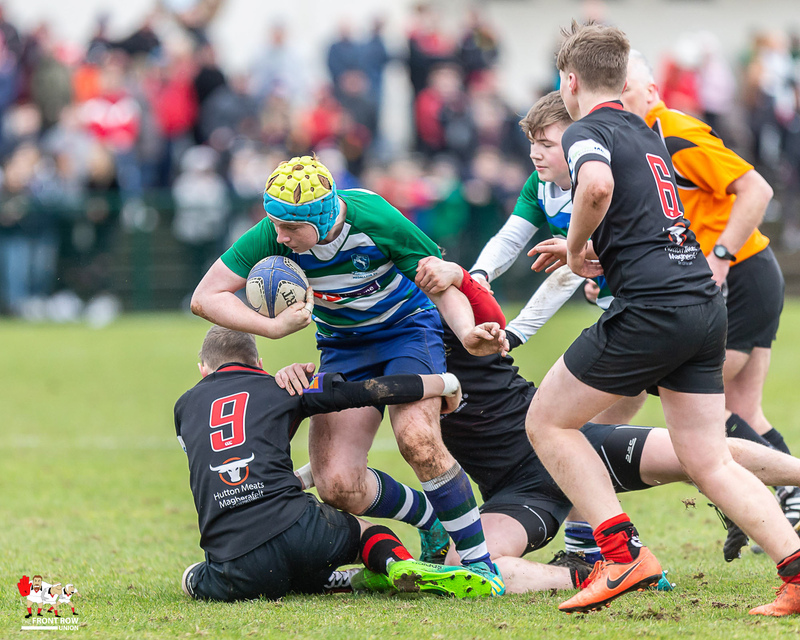 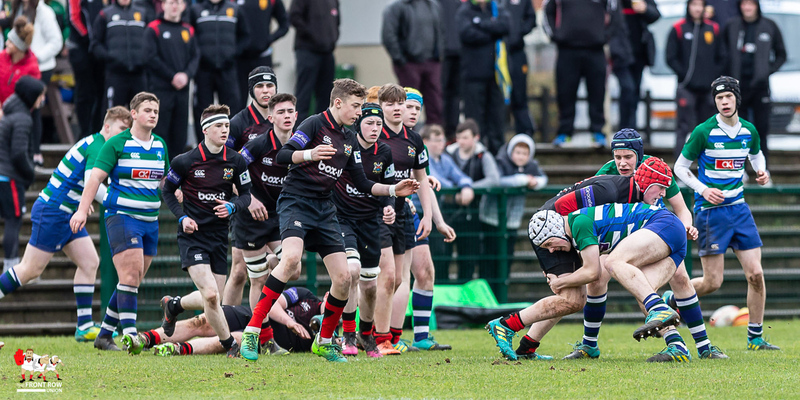 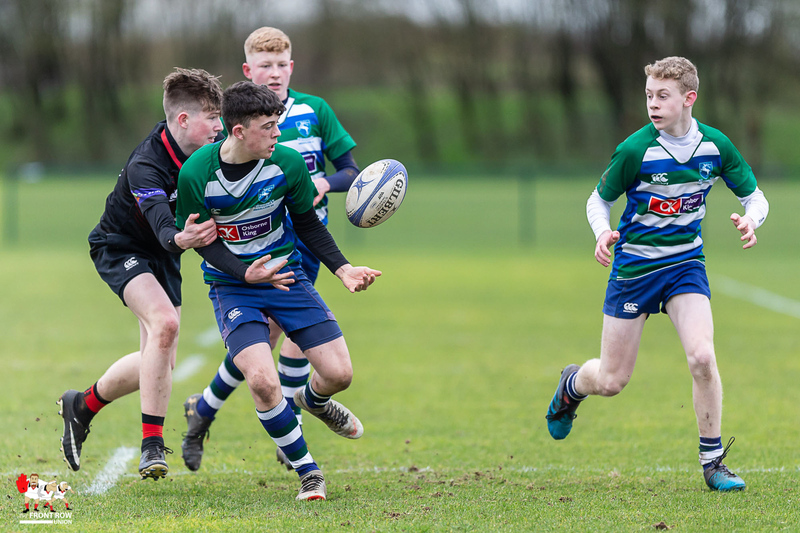 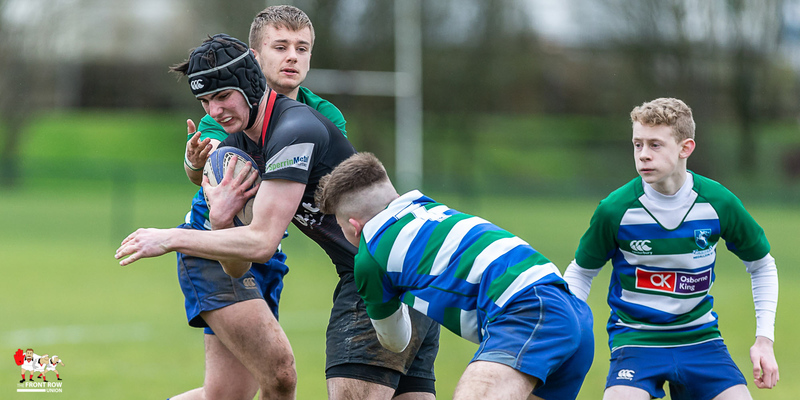 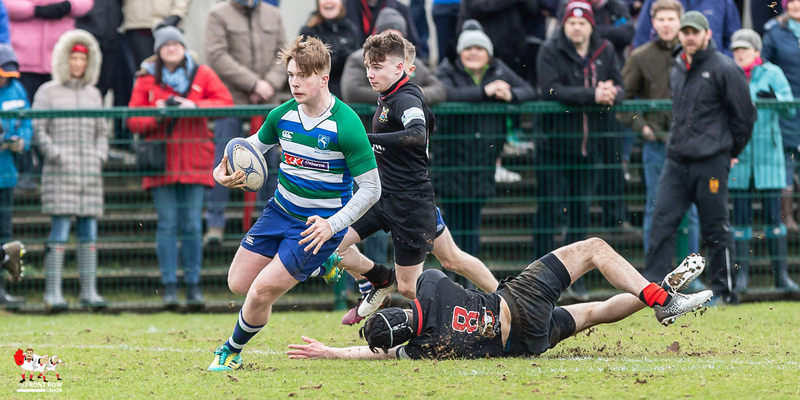 Saturday 16th March 2019, Grosvenor Grammar hold on to record a one point victory against Rainey Endowed in the Medallion Plate Final at Roughfort Road. 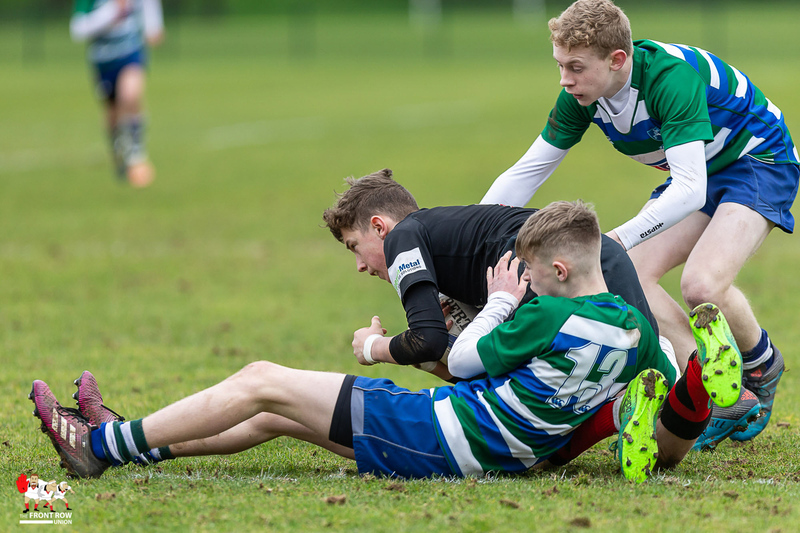 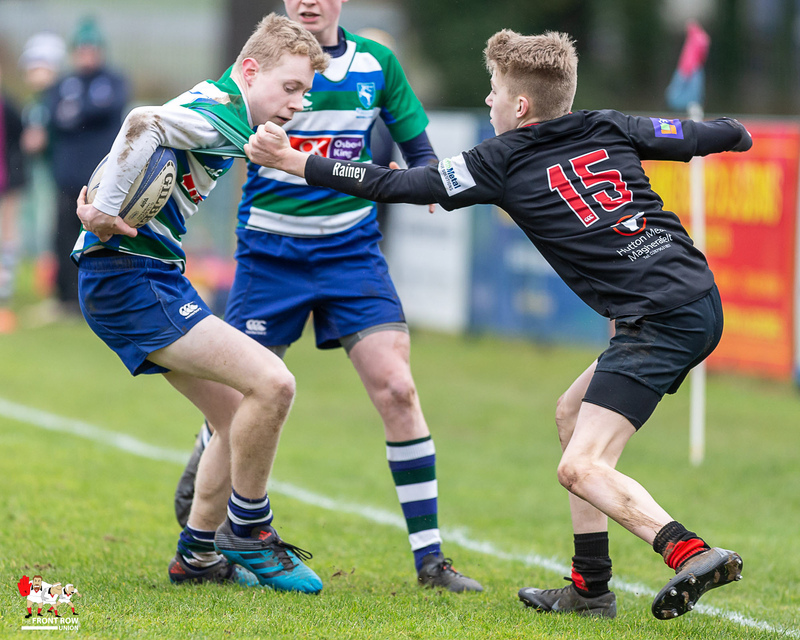 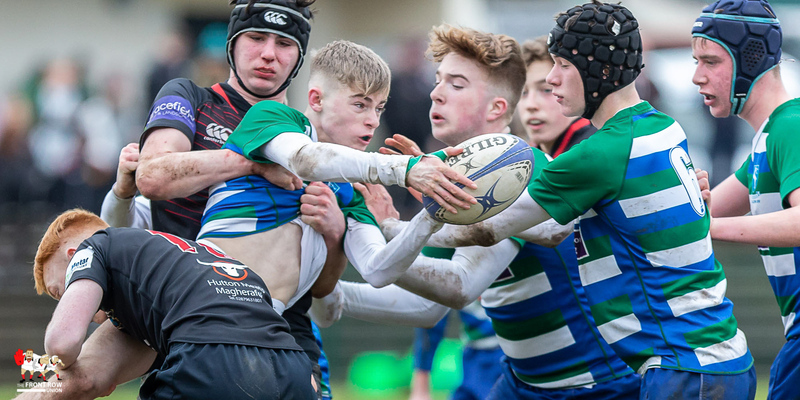 It was a typical ‘Roughfort morning’, wet & cold, with a 30 mph wind blowing straight down the pitch, for the Medallion Plate Final between Grosvenor Grammar School and Rainey Endowed School. 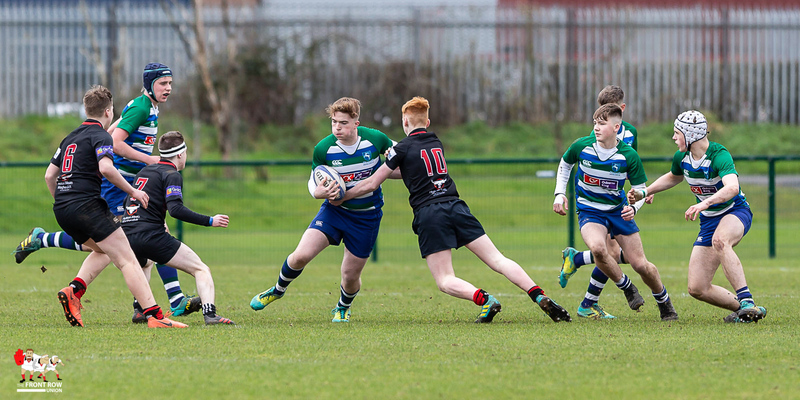 Playing with the wind, Grosvenor launched a series of attacks, which were repulsed by a sound Rainey defence. 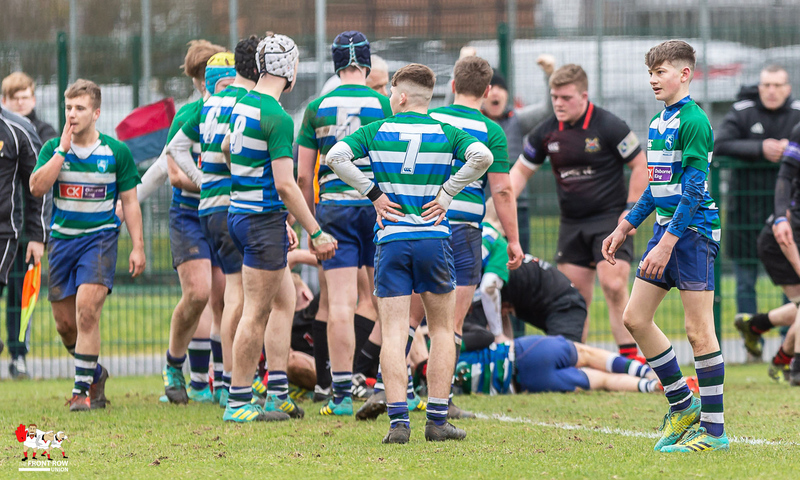 Midway through the first half Grosvenor took the lead with a well struck penalty goal, by Lewis Young, from almost the halfway line. 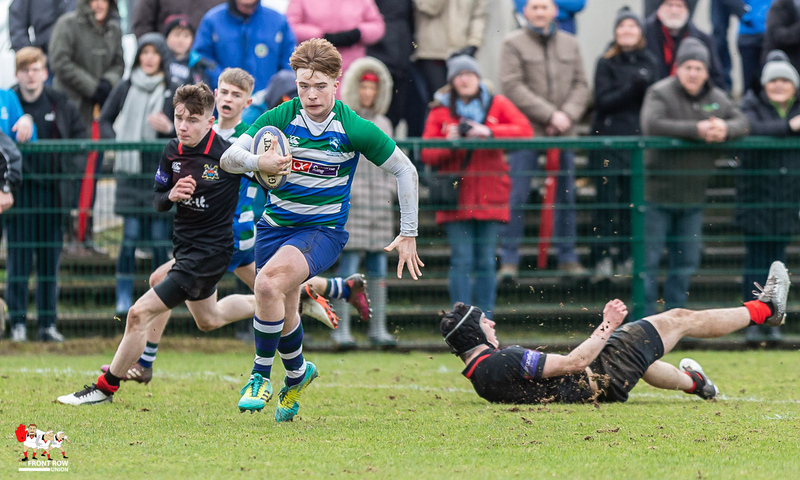 The Rainey finally conceded a try, when Lewis Young finished off a sweeping move, when he ran in from 40 metres to touch down close to the posts. 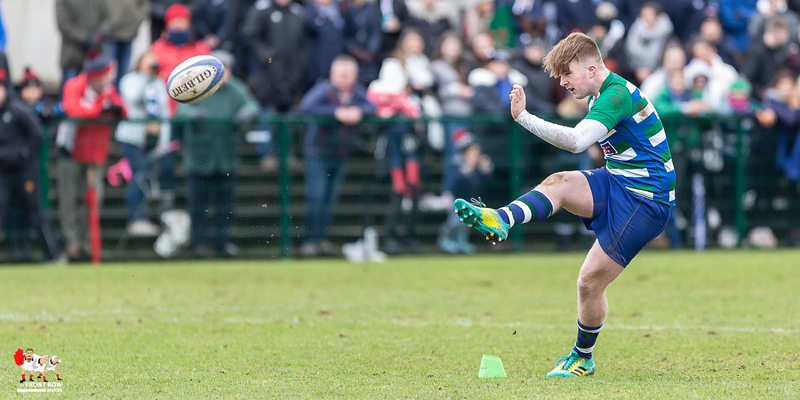 The conversion failed, with the kick hooked wide, when the ball moved on the tee as Lewis Young kicked it. 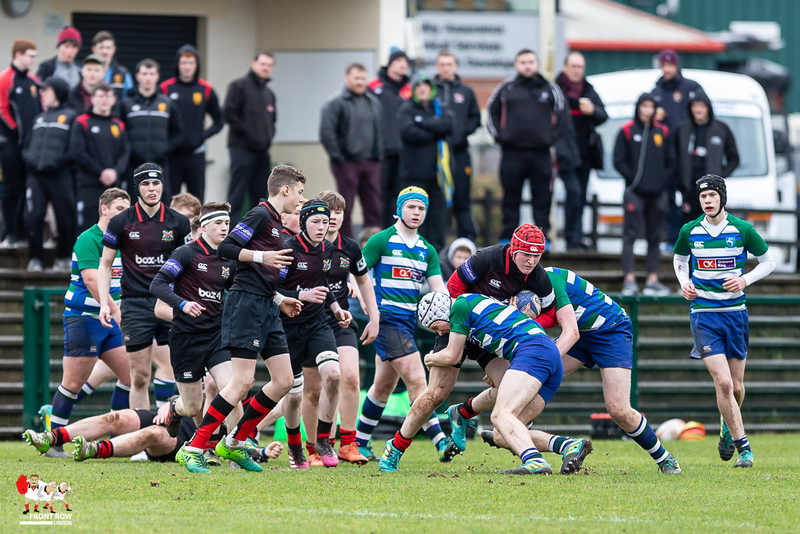 Grosvenor turned around into the wind with a 8 – 0 halftime lead. 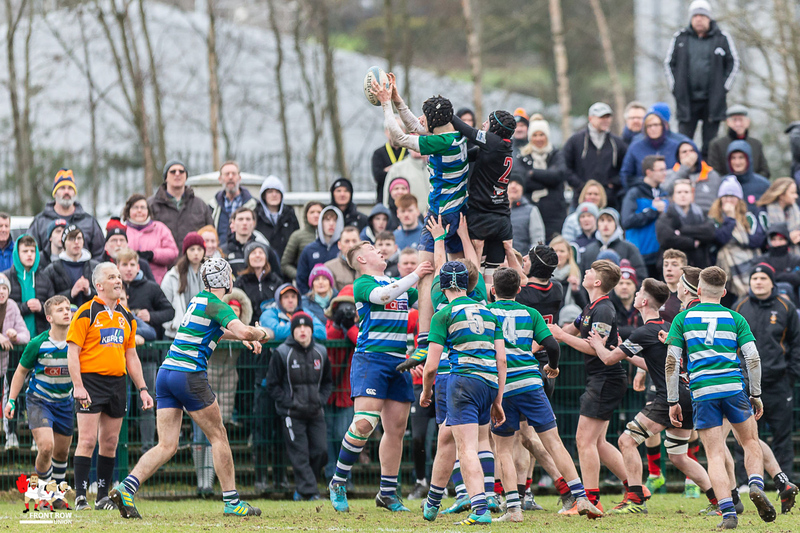 The second half was only minutes old when Andrew Stewart squeezed in the corner for Rainey, following a number of phases close to the Grosvenor line. 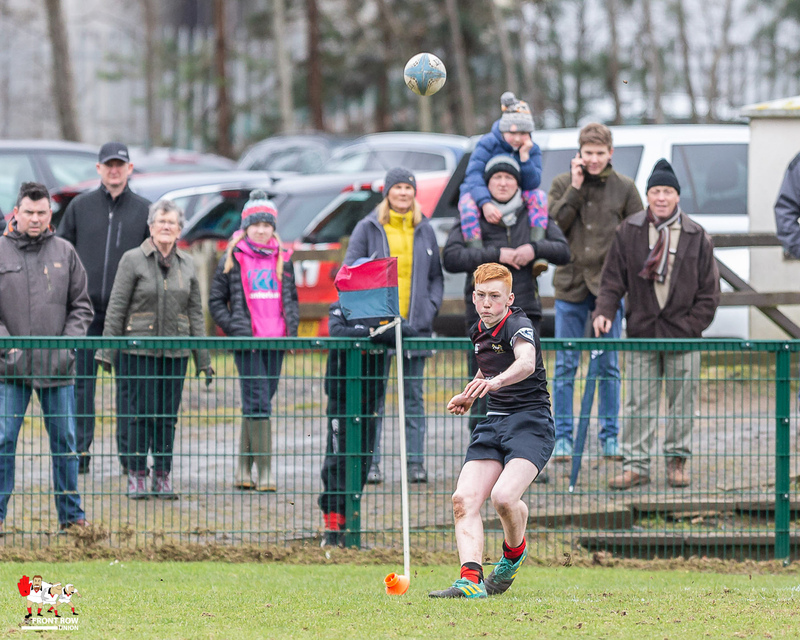 Matthew Thom judged the strong wind accurately, landing the conversion from the touchline. 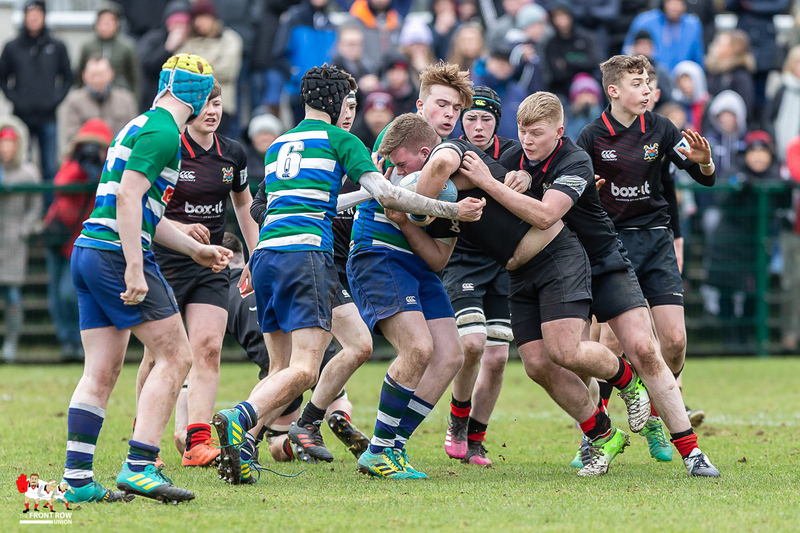 Grosvenor’s forward ball control prevented Rainey gaining meaningful possession and they were able to play out the game in Rainey’s half. 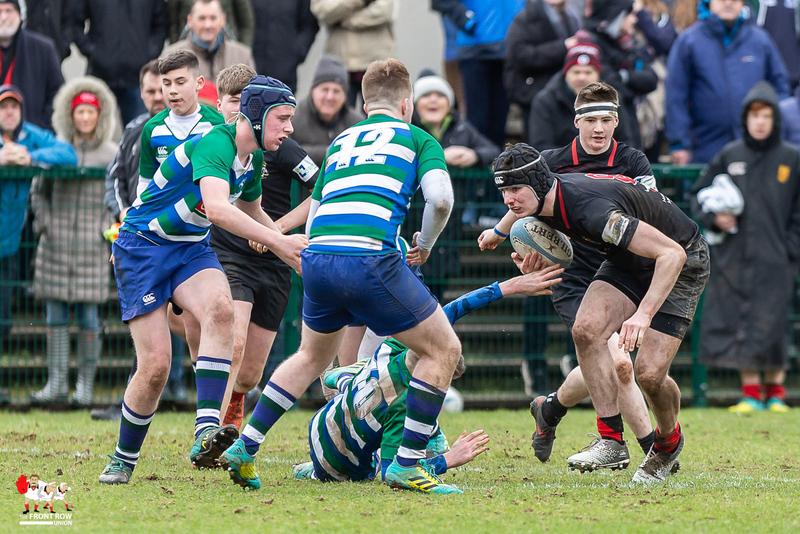 Despite having the wind at their backs Rainey were unable to gain a foothold in the Grosvenor ’22’ and couldn’t score again. 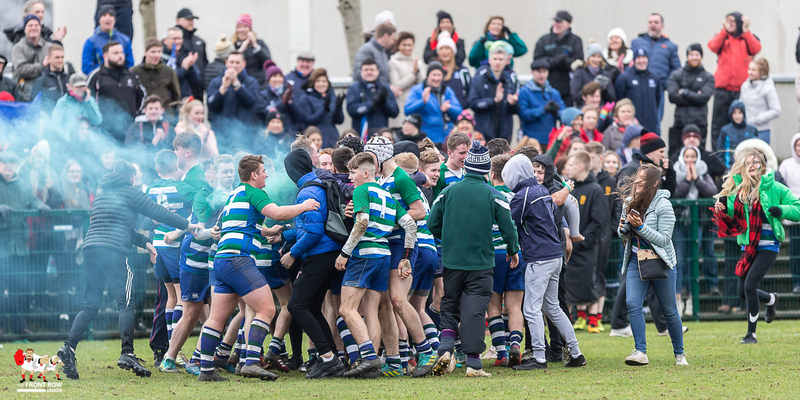 For their 2nd half defence Grosvenor were worthy 8 – 7 winners of the Medallion Plate.